"Sampath Speaking" - the thoughts of an Insurer from Thiruvallikkeni: substitution on filed ! ~ fake fielding and more !! substitution on filed ! ~ fake fielding and more !! The 1st Test at Eden Gardens hangs on a delicate balance. 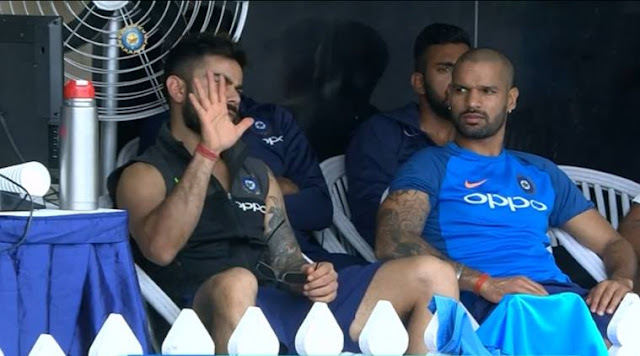 India struggling to recover from that awful start of top order failure, some respectability restored by late order and tail enders but Srilanka gaining a handsome lead – has left Indians fighting hard. Lot interesting things happening on the field at Kolkata !! Remember, that early morning on 12th Jan 1978 as we anxiously listened to the radio – Aussies were reeling under – but whether they could avoid the follow-on ? - Peter Toohey 82 pulled Karsan Ghavri and a sprinting Madan lal took a good catch to make it 2-2; Aussies defeated by an innings and 2 runs at Sydney. Those were the days when substitutes cannot stand in close-in and specialist positions and a commentator remarked that way, Madan lal should not be allowed anywhere in the field as substitute !! Substitutes are nothing new ! ~ it would be proud moment for us to enter the field in any cricket match, at any level, carrying water, replacing a fielder or having a specific errand – appearance matters !! ~ in Nov 1983, at Ahmedabad, Gursharan Singh, a promising talent, but played only one match, took four catches as a substitute, three of them off Kapil Dev in the second innings. CRicinfo stats reveals that the first substitute catch in a Test match was taken by a member of the opposing side… and the captain, to boot! When WG Grace injured a finger in the first Test ever played at Lord's, in 1884, the fielder who came out to replace him was the Australian skipper, Billy Murdoch. He was soon in action, when Australia's top scorer, "Tup" Scott, offered a catch off the legspin of AG Steel. Murdoch held on, and his side were all out. This morning, Srilankans slumped to 201/7 when Dinesh Chandimal got out – but a fifty by HMRKB Hearth took them to 294. Rangana Herath's third Test fifty propped up Sri Lanka's lead to 122 before the visitors were bowled out for 294 on the fourth afternoon at the Eden Gardens. Mohammed Shami and Bhuvneshwar Kumar took 4 apiece; with Umesh Yadav also taking two wickets, this was the third time India's seamers took all ten wickets in a Test innings at home, and the first since 1983-84. 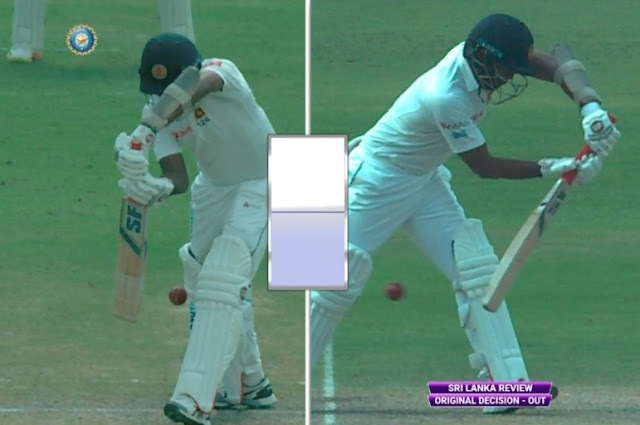 Dilruwan Perera, the Sri Lanka allrounder, survived an lbw decision after an unusual route to taking the assistance of the Decision Review System (DRS). At the time of the incident, Dilruwan was batting on 0 off 7 balls. He apparently turned and started back when the Umpire gave him out but had some assistance from the dressing room (which was on his view as he turned back). The non-striker Rangana Herath offered no opinion on the review !! DRS protocol says that the captain may consult the bowler and other fielders, and the two batsmen may consult with each other prior to deciding whether to request a Player Review. Under no circumstances is any player permitted to query an umpire about any aspect of a decision before deciding on whether or not to request a Player Review. If the on-field umpires believe that the captain or either batsman has received direct or indirect input emanating other than from the players on the field, then they may at their discretion decline the request for a Player Review. It was in the 57th over of Sri Lanka's innings, Nigel Llong upheld an lbw appeal from Mohammed Shami when an indipper beat Dilruwan's forward defensive and hit him on the back pad. Dilruwan turned around and began walking back, then asked fro a review Llong had to change his decision. In the Bengaluru Test earlier this year, umpires stopped Steven Smith from reviewing an lbw decision against him after he was seen seeking advice from the Australian dressing room. As you may have observed the Umpires for this match are : Richard Kettleborough and Nigel Llong; with Joel Wilson as TV Umpire. .. .. .. and there came the substitution .. . Down with a throat infection, on-field umpire Richard Kettleborough pulled out of day three's play on Saturday. Kettleborough was replaced by West Indies' Joel Wilson, who accompanied Nigel Long to start the day's proceedings as India resumed on 74/5 at Eden Gardens. Fourth umpire Anil Chaudhary became the TV umpire while Cricket Association of Bengal's Binod Thakur was inducted on board.